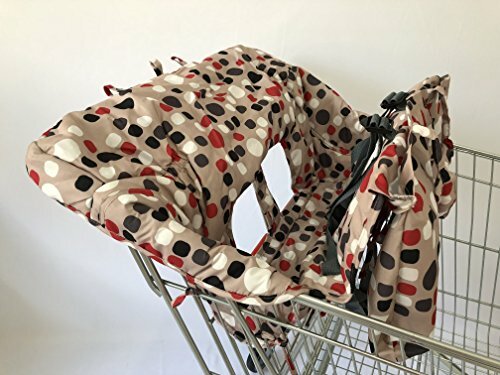 PROTECT BABY FROM GERM --- 2-in-1 cover will give baby 360 degrees of protection from germs and bacteria found on most grocery carts and high chairs meaning less coughs and colds for your little one.Folds Into Compact Handbag,easy to carry. LARGE AND UNIVERSAL FIT --- Spacious and specifically made to fit on every high chair. Provides your kid with a play area as it has 3 fabric circles wherein you can attach your baby's stuff like pacifiers, toys, and teether rings. SAFE AND DURABLE --- Comes with adjustable locking straps to hold your kid securely. Materials are sturdy and fit enough to keep your baby safe. EASY TO WASHING --- Made with pure polyester, this cart cover is free from BPA, Phthalates, Latex and Lead for your baby's health and safety. Plus, it is machine wash too. 100% RISK FREE --- Our product comes with a 100% risk free guarantee, so enhance your shopping or restaurant experience by purchasing our Grocery Cart Cover TODAY!! The padding will make it comfy during an outing with mom. With four sets of ties and an adjustable locking strap, the hammock will be secured to the cart. We designed it mainly for the standard single-seat shopping carts and restaurant highchairs. There is a zippered front pocket to store keys, cell phones, and clean wipes etc. it's made from 100% polyester so clean up is a breeze. They are also machine-washable too. If you have any questions about this product by SEALOVESFLOWER, contact us by completing and submitting the form below. If you are looking for a specif part number, please include it with your message.